The Métis have always viewed themselves as a distinct people with their own will and with inherent Indigenous and settler rights. The Rupert’s Land Métis were the only mixed-descent population in what is now Canada to develop nationalism — their group identity crystallized in the Red River Settlement in the late 1790s. A central tenet of early Métis nationalist thinking was the notion that they constituted “la nouvelle nation” or a new nation that was part of but also distinct from their First Nations and Euro-Canadian/European ancestors. Their group identity affected the Métis’ relations with other groups, particularly when they “resisted” attempts to curb their rights or lifeways. Early Métis nationalists tried to preserve their independent Aboriginal way of life by adapting to local circumstances, and resisting the imposition of European/Euro-Canadian culture upon their own Indigenous lifeways. The first stirrings of Métis nationalism occurred from 1811-1816 between the forks of the Assiniboine River and Red River, in present-day Manitoba. The Métis felt that their Aboriginal rights were violated when the Saulteaux Chief Peguis, without consultation with other Indigenous nations, signed a treaty with Hudson’s Bay Company in order to create the Selkirk Colony in 1811. The Métis claimed prior occupancy in the region through their Cree foremothers. They felt that Chief Peguis, who had come to the Red River area in the 1790s, did not have the right to cede land that more rightly belonged to the Cree Nation — and its descendants, including the Métis. In 1812, the Selkirk settlers began arriving in Rupert’s Land under the colonization efforts of Thomas Douglas, the fifth Earl of Selkirk. The Métis resented this move since settled agrarians were detrimental to the fur and bison trades. Unfortunately, crops failed in the first two years of settlement, and to ensure that the settlers did not starve, the appointed governor of Assiniboia, Miles Macdonell, issued a series of edicts in 1814, known as the Pemmican Proclamation. The first proclamation prohibited the export of pemmican, and the second tried to curb the Métis’ practice of “running the buffalo” (hunting the bison from horseback), which usually took the bison out of the territory for better hunting grounds further south. The Pemmican Proclamation was the primary impetus for a nascent Métis nationalism. In response to this interruption of their lifeways, the Métis hunted bison, traded pemmican, arrested Macdonell for interfering with Métis sovereignty, and ordered the settlers’ deportation. In 1815, HBC issued a treaty that ensured that the settlers would leave the colony and that all hostilities would be forgotten. However, the tranquillity was short-lived; the new governor, Robert Semple, wanted to control the bison and pemmican trades and tried to bring more settlers to the region. 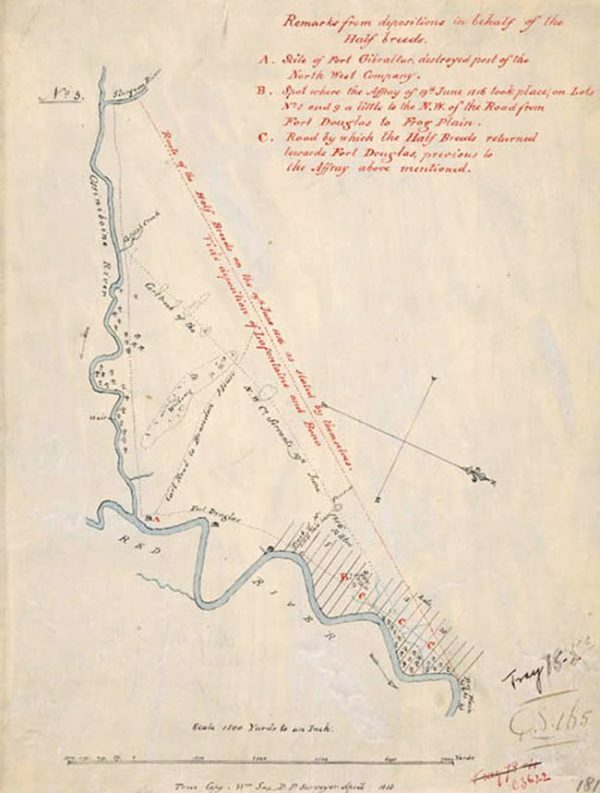 Map of the Battle of Seven Oaks area from 1818. Later, at the Battle of Seven Oaks (June 19, 1816), the Métis, under Cuthbert Grant, resisted HBC’s efforts to curb their livelihood as fur trade provisioners for the rival North West Company. Métis poet and raconteur Pierre Falcon indicated in his famous song “La Bataille des Sept Chênes” (the Battle of Seven Oaks) that HBC were “foreigners” and “Englishmen” bent on “robbing” the country, while the Bois-brûlés (the Métis) “chased” them from the battlefield. In the Oral Tradition, the Battle of Seven Oaks is remembered as a great Métis victory. The Métis asserted their sovereignty and further ensured the right to use the l and and harvest its resources. Hudson’s Bay Company capitulated and no more settlers came to the region for a time. Even in 1815, prior to the Battle of Seven Oaks, the Métis created Canada’s oldest known patriotic flag — the Métis infinity flag — which symbolizes the fusing of Indigenous and European cultures to form a new and distinct people. Bolstered by the idea that they constituted “la nouvelle nation,” the Métis became a dominant force on the northern plains. Through the 1820s-50s, the Métis continued to assert their sovereignty and group identity. Other Indigenous nations had, by this time, recognized the Métis’ place in plains society and accommodated them. The Métis were known as the “Otipemisiwak,” “gens libres” or the “Freemen” because of their desire to be free and resist being controlled by others. They were also known as “Apeetogosan,” “Wissakodewinimi,” “Chicot” and “Bois-brûlés” because of their mixed heritage, and finally as the “Flower Beadwork People” because of their richly-adorned floral beadwork clothing. These names, all variations on a theme, demonstrate that the Métis themselves were a nation and were recognized as such by other Indigenous nations. During the 19th century and leading up to the creation of the Manitoba Act, the Métis practised a form of popular sovereignty and carefully guarded their Indigenous rights—particularly regarding the land and its resources. This put them into conflict with others who wanted to infringe upon their rights—including HBC, the Dakota and the Dominion of Canada. Perhaps to no greater extent did the Métis assert their group identity than in the great bison hunts of the 1840s-70s. This brought them into conflict with the Dakota (Yanktonai Sioux) in the 1840s and ’50s. The two nations fought over the rich bison-hunting grounds in present-day North Dakota, which culminated with the Battle of Grand Coteau (July 13-14, 1851). In this battle, the last of a series fought between these two nations, a small number of Métis defeated a much larger host of Dakota. The Dakota were so impressed with the Métis’ martial prowess and superior marksmanship, that the two nations concluded a peace treaty. Extending from the bison hunt, the Métis practised a form of consensual democracy. Each year, prior to the departure of the two bison-hunting camps (one to the Saskatchewan River Forks and the other to what is now North Dakota), informal assemblies led by Elders were organized, and laws were implemented. Those who transgressed against society’s rules were punished. At these assemblies, the Métis elected a chief or general of the hunt. Following that, a series of “dizaines” or a force of 10 men selected a captain. All captains reported directly to the Chief and in turn they coordinated their hunting and resource preservation strategy. The Métis’ informal face-to-face democratic organization lent itself well to military structure and to the implementation of self-government. For instance, during the 1885 Northwest Resistance, the Métis under the leadership of war chief Gabriel Dumont used the bison hunt’s paramilitary structure to fight the Canadian military. In addition, in the 1870s, the Métis also practised self-government through the Council of St. Laurent near present-day Batoche, Sask. In fact, when the council’s president, Gabriel Dumont, tried to enforce a measure of bison-hunting laws (now called “Laws of St. Laurent”) in 1875, the North West Mounted Police forcibly shut down the council.